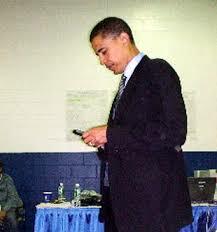 Perhaps a silly observation, but I think it is great news that President Obama is keeping his blackberry with him as President. It models a 21st century leadership, digitally proficient and digitally connected. Blackberries, iPhones, and other smartphones are the central digital tool of our age, and they belong, this blogger believes, in the Oval Office and in the classroom. Yesterday I was interviewed for a high school newspaper by an 11th grade student who emailed me– mid-day– from his iPhone to arrange the interview, and then called me to conduct the interview from his iPhone. This is good schooling and good learning.